Why choose Masonry? 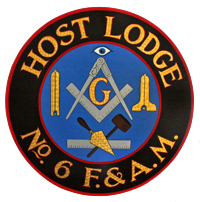 – Host Lodge #6 F. & A.M.
We are the largest Fraternity in the history of the world. We have been tried through the ages, and found true. The crossroads of the world bear the imprint of our feet, and the cathedrals of all nations mark the skill of our hands. In our heart is wisdom and strength and courage for those who ask. We are not church, nor party, nor school, yet our sons bear a full share of responsibility to God, to country, to neighbor and themselves. We consist of the most composers, artists, athletes, scientists, fathers, sons, military leaders, teachers, actors, musicians, doctors, lawyers, poets, philosophers, and political figures of any organization in the world. They are freemen, tenacious of their liberties and alert to lurking danger. We ponder the sand within the glass and think how small is a single life in the eternal universe. Always have we taught immortaility, and even as we raise men from darkness into light, we are a way of life. And while others will break us down with false allegations, unproven suspicion and cowardly assumptions, we lift up the fallen and shelter the sick. We hark to the orphans’ cry, the widows tears, the pain of the old and destitute.We ARE Freemasonry!